Struggling between performance and environment cohesion when deploying business wireless APs is in past. The stylish exterior of NWA1120 series is suitable for any interior that not only outperforms but also blends into the interior better as well prevents equipment theft. To create a thoroughly enhanced Wi-Fi experience, NWA1120 series made a big move on optimized antennas and RF design via fine-tune software and innovative hardware. Featuring with DCS and load-balance, NWA1120 series delivers smooth and superior Wi-Fi experience in workplaces. 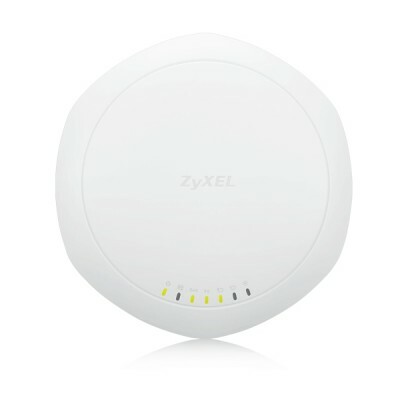 NWA1120 series provides repeater/root-AP mode compatibility with Zyxel Unified Pro and Unified APs, that users can extend wireless connectivity via enterprise grade WDS to difficult cabling locations without the bother of troublesome cabling. Also, as an ideal solution, NWA1120 series offers an array of practical features like multiple SSID and solid Wi-Fi security. The refreshed NWA1120 series features streamline controller-less deployment. Out of the box and finish three steps configuration with ZON then NWA1120 series capable of operating autonomously without extra computer or special management tool as well as allowing administrator easy monitor via any SNMP tool in hand, even not a networking expert can handle it easily.